Where are the Small and Medium-Sized Enterprises in Regards to Digitization? 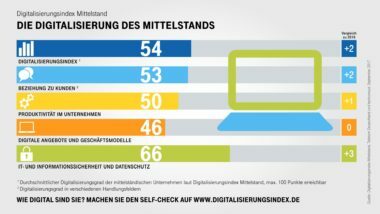 And yet, bigger companies still are better prepared in regards to digitization than small ones, as shown in the Telekom study „Der Digitale Status Quo Des Mittelstandes“ [in German]. According to this study, the biggest vulnerability for the German small and medium-sized companies is in the development of digital offers and business models. And that is really too bad as this is one of the most profitable areas. Where using Big Data is concerned, unfortunately, the situation is not much better according to an Artikel by Die Zeit [in German] zeigt. Despite the fact that many companies now collect and save data, only about every third company uses them to customize their assortment of products/services to current demands. And only about every eighth small or medium-sized company can adapt offers and products to the respective client thanks to Big Data. The reasons why many small and medium-sized companies still struggle with digitizing their company are varied. According to an article in the Handelsblatt [in German], a lot of small and medium-sized companies say that they do not find enough skilled personell to increase the area and because of this they don’t invest at all or don’t invest enough in the digitization of their business. A simple shortage of talented professionals. In addition, many small and medium-sized companies hold on too tight to their old, rigid (and very successful) processes and rules. Considering only one area at a time [link to article in German] in these companies is detrimental to their digitization. And that isn’t all. In one of their articles, the WirtschaftsWoche cites another study in which a good 75% of the respondents consider digitization a necessity, but at the same time every second respondent considers digitization a gamble. These negative feelings contribute to the situation that small and medium-sized companies simply don’t dare to take the next step toward digitization. The General Data Protection Regulation (GDPR) that took effect in May of 2018 unsettled about two thirds of the responding companies in another study. But digitization isn’t just done because a company doesn’t want to fall behind. The opportunities that exist because of digitization [article in German] are just too huge: Digital processes facilitate communication within the company and allow for a quicker and more effective response to client wishes and needs. Mobile teams and jobs make the company more efficient. Today, even smaller firms can conquer the international market reasonably quickly, if they offer the right digital products and services. Digitization has even already started to pay off for many companies as reported in the Handwerk Magazin [article in German] this summer. More than one third of the responding companies in a big digitization study saw a so-called “digital dividend”. This means that one in three of these companies had higher benefits than costs in regards to the already implemented digitization projects. And for about another third, cost and benefits were at least even. Digitization can seem very abstract. Many entrepreneurs and managers don’t really know where their company is in regards to their Digital Readiness. And yet, it doesn’t have to be this hard. At 8 a.m. Consult, we have developed an extensive guide to digitization, that you can download here for free: digital transformation checklist. The digital transformation checklist explains clearly how every small and medium-sized company can find out where they stand in regards to their digitization in just 10 steps and how they can continue to implement further steps. At the end of every step, you will be presented with a question that you can check off when you are ready to move to the next step. You can find all the details in the actual document.